The College has introduced a new and comprehensive Vacation Care program, offering an exciting and varied program for children to experience and enjoy; featuring excursions, incursions and structured ‘home’ days. Open to all Junior School-aged children (5 to 12 years old), the program operates from 7:30am to 6:00pm daily. The program will operate during the Term One, Two (3 weeks) and Three holidays with a longer care program during the summer vacation. 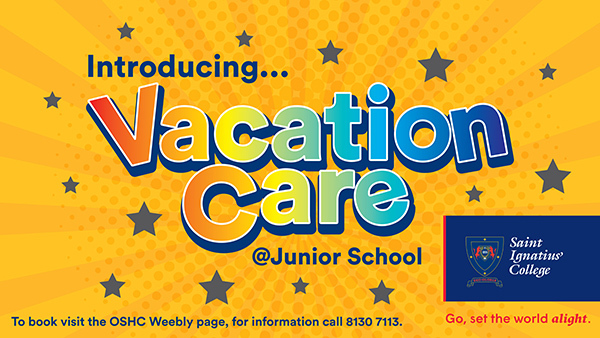 The daily rate for the Vacation Care program is $70 per child which will be held in the OSHC building (62 Queen Street, Norwood) with all children needing to be signed in and out at this location, including on excursion days. Parents and Caregivers are encouraged to book as soon as possible to avoid missing out, bookings are only taken with consent the form and the full payment of fees. These bookings are non-refundable unless your child is sick and has a doctor’s certificate. Bookings must be made by the Monday prior to the start of the school holidays, any days booked after this date may not be possible and will incur a $20 late fee. A reminder to please email any bookings or cancellations to oshc@ignatius.sa.edu.au or call 8130 7113; for any other enquiries please email toni.carey@ignatius.sa.edu.au.